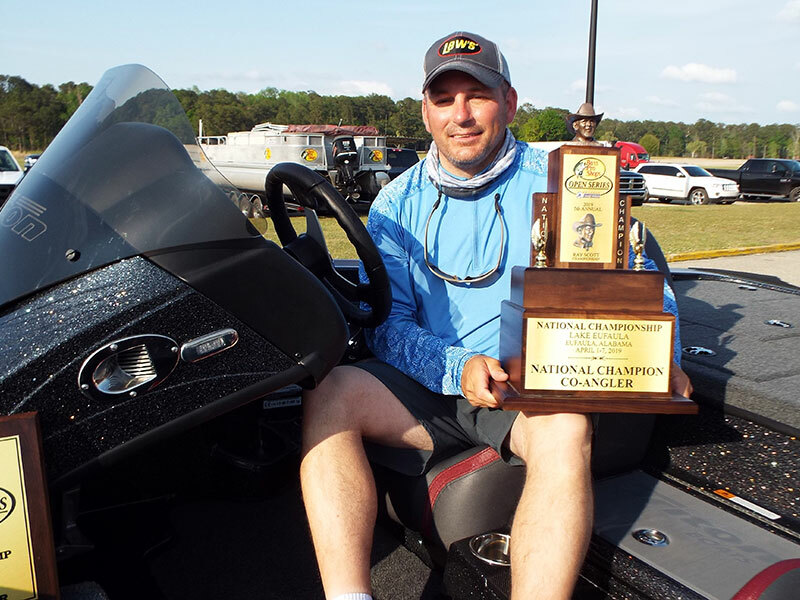 ATHENS, Ala. – After three straight days at the head of the pack, Bryan D. New won the Boater Division in the 2019 Ray Scott Championship, held April 4-7 on Walter F. George Reservoir near Eufaula, Ala. The Belmont, N.C. angler finished the four-day tournament with a perfect catch of 20 bass weighing 98.70 pounds. An 8.80-pound bucketmouth he caught on Day 3 also took top honors in the tournament big bass competition. For the victory, New won $50,000 in cash plus a new 21TRX Triton boat equipped with a 250-horsepower Mercury Pro XS outboard motor. 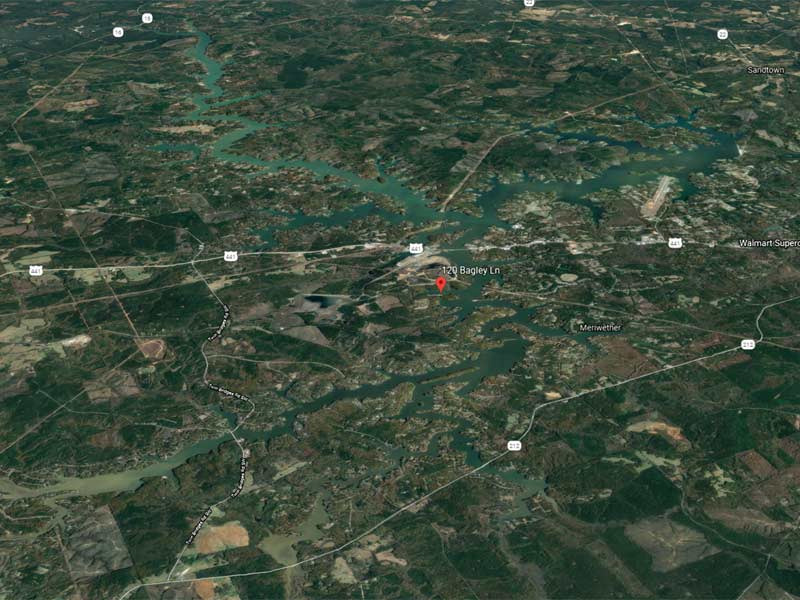 During each off the four days of fishing at Walter F. George Reservoir, better known as Lake Eufaula, New landed five-bass tournament limits. New’s Day 3 catch of 26.03 pounds was one of only two bags exceeding 26 pounds caught in the event. New placed second on Day 1 with 25.69 pounds, but took the lead the following day with a 25.61-pound bag and never relinquished it. He capped off his winning effort with 21.37 pounds on the final day to seal the victory by more than eight pounds. In second for the boaters, Scott Montgomery, a local favorite from Eufaula, Ala., also finished with four straight five-bass tournament limits. He moved up one place from Day 3 with a 23.68-pound bag that gave him a total of 90.65 pounds including a 6.82-pound lunker. Montgomery stayed in the top six each day with earlier catches of 24.63, 22.00 and 20.34 pounds. Ryan Ingram of Phenix City, Ala. also moved up one spot on the last day to finish third with 20 bass going 89.45 pounds topped by a 6.52-pounder. He weighed in 25.55 pounds, the biggest bag on the final day, to add to his other weights of 24.69, 23.94 and 15.27 pounds to stay in the top five throughout the competition. Trevor Fitzgerald of Belleview, Fla. jumped from sixth place take fourth on the final day with a 23.80-pound catch. An 8.42-pounder helped him make the leap. Fitzgerald finished with a perfect 20 bass limit weighing 84.66 pounds. He also brought in catches weighing 22.31, 13.13 and 25.42 pounds. Completing the top five boaters, Chandler A. Ray of Edsion, Ga. finished with 20 bass and 84.48 pounds including a 6.90-pound kicker. He stayed in the top eight throughout the tournament with catches of 22.86, 24.03 and 14.29 pounds. On the final day, he brought in 23.30 pounds. In the Co-Angler Division, Jeremy S. Stoute of Crestview, Fla. won the championship with seven bass weighing 32.87 pounds. He anchored his catch with a 7.24-pounder that also won the Co-Angler Division lunker title. For winning the championship, Stoute took home $25,000 in cash plus a new 19TRX Triton boat powered by a 225-horsepower Mercury Pro XS outboard motor. Fishing with Montgomery on the final day, Stoute caught one fish weighing 5.51 pounds, big enough to lift him from third place to the title. On the first day, Stoute landed one 1.21-pound bass, putting him at 169th place out of 195 competitors in the division. He made up for it on the second day with a 16.85-pound catch that vaulted him up 162 notches into seventh place. He landed 9.30 pounds on Day 3 to move into third. Tim L. Blanton of Climax, Ga. finished second among the co-anglers with a perfect four consecutive three-bass division limits to give him a total of 32.51 pounds. On the final day, he brought in 11.43 pounds with 6.71-pound kicker, the largest catch by any co-angler that day. That bag allowed him to move up from 14th place to less than six ounces from championship. On the other three days, he landed bags weighing 6.53, 7.00 and 7.55 pounds. Just three ounces behind, Durward Henderson of Titus, Ala. finished third with nine bass at 32.33 pounds. Catching 4.82 pounds on the final day, he dropped one position. He landed other catches of 12.87, 12.24 and 2.40 pounds with a 5-pound kicker. Jim C. English of Gordon, Ala. rounded out the top five co-anglers by finishing with 10 bass and 29.84 pounds including a 5.87-pound kicker. He brought in catches weighing 8.03, 9.31, 10.49 and 2.01 pounds. 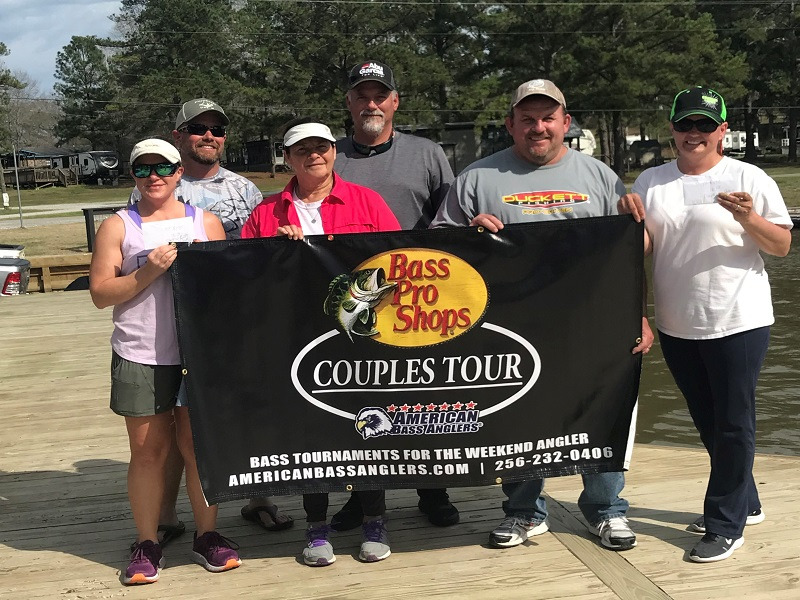 The Ray Scott Championship tournament culminated another season in the American Bass Anglers Open Series. 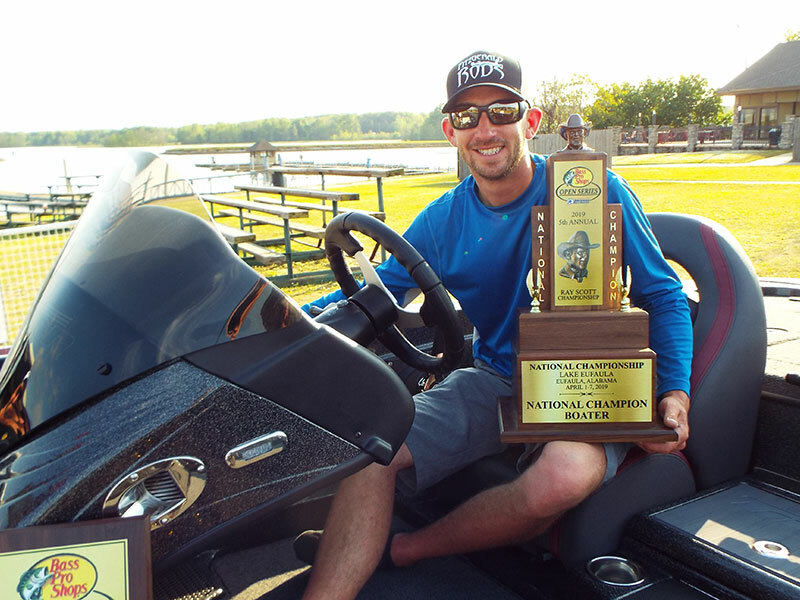 Nearly 200 anglers in each division fished the event, each one earning a shot at the title by advancing through 18 divisions and nine area championships.